After going to vote today I took a "scenic detour" back, going west on US 158 from Reidsville. When you get to the Monroeton community, turn right onto Monroeton Road (at the original Monroeton Elementary School buiding). 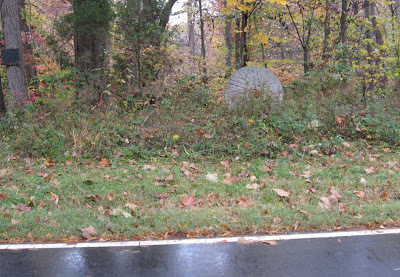 This stone marks the site west of Reidsville visited by George Washington during his tour of the southern states in 1791, when he was the first President of the United States. I've heard a lot of people say over the years that the stone even marks the spot where Washington and his colleagues camped while in the Monroeton area. The main draw during this leg of Washington's tour was the nearby Troublesome Creek Iron Works, which was used during the Revolutionary War. And then in 1781 General Nathaniel Greene and his soldiers camped there after the decisive Battle of Guilford Courthouse. By the way, also nearby is Speedwell Presbyterian Church. Organized in 1759, it's not only the oldest church in Rockingham County but also one of the oldest in the entire country. In the cemetery behind the present building (built in 1844) there can still be found the grave markers of many soldiers who fought and died at Guilford Courthouse. And though it has never been conclusively proven, I have heard a number of people tell that Washington did attend a worship service at Speedwell while he was in the area. In light of all that's going on today, and the tremendous amount of raw emotion that this election seems to have generated, I thought it would be a neat thing to pause for a bit. And reflect on where we as a country have come from... and what it took to get us here. That, to me anyway, certainly merits some appreciation. Yes, George Washington did have breakfast at the Troublesome Iron Works with my ancestor Benjamin Jones. Mention of it is made in Washington's diary. He was accompanied by a Mr. Jackson who offended Elizabeth Jones with his prideful manner, and who passed the story on to my great, great grandfather Beverly Jones.